We motored North towards the party Island of Ios, into the meltemi, into the wind, sails tightly packed-away, avoiding the katabatics. Wind speeds were between 40 and 50 knots, gale force 10, with what the skipper described as flying water from the tops of the whitecaps. Red, Poodle and Spanial donned anti-seasickness wristbands. Labrador in full sensible waterproofs stayed dry on deck to the left of the skipper. To the left of Labrador Red lay back-to-the-bench shivering in full sun and swimwear. Red was unable to sit-up lest the action give momentum to Red’s stomach contents. I dragged myself along the boat, down the almost-as-dangerous-as-the-wendy-house-stairs and went below to bring-up Red’s fleece. It was like navigating a fairground ride without a laughing audience. Poodle was buried beneath towels lying on the bench next to me, groaning. All the colour had drained from Spaniel’s lips laying back to the bench opposite facing the sky. Retriever was head over the side wretching while Spanial and I held a leg each lest the jerking of the boat lever Retriever ir-retriever-bly overboard. Lighting a cigarette is a tricky manouvre while helming a boat in a gale, one has to admire the skippers dexterity and skill. With each puff on the cigarette the pack pulled either hands, towels or jacket collars over their nose and mouth to filter any trajectile-style impact of the smoke on thier bouncing stomachs. Skipper put the boat on auto-pilot and went below to brew a coffee. As soon as he’d left the deck labrador elegently turned, ejaculated a globule of stomach contents in one smooth action off the stern, then returned to face the wind looking like a true stalwart. Good timing and action, 10 for technique I’d say. 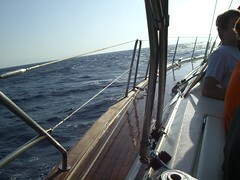 I never did get real sailing experience #2. This scribble was published on Saturday, August 16th, 2008. You can follow any banter on this scribble with the RSS 2.0 feed. You can share your inspired musings after typing the anti spam word near the bottom of the page. But no Pinging because its too naughty. Motoring?! Good grief. It’s SAILING! If you’re not afraid you’re going to die, there’s not enough wind. Put those sheets up and get on with it!